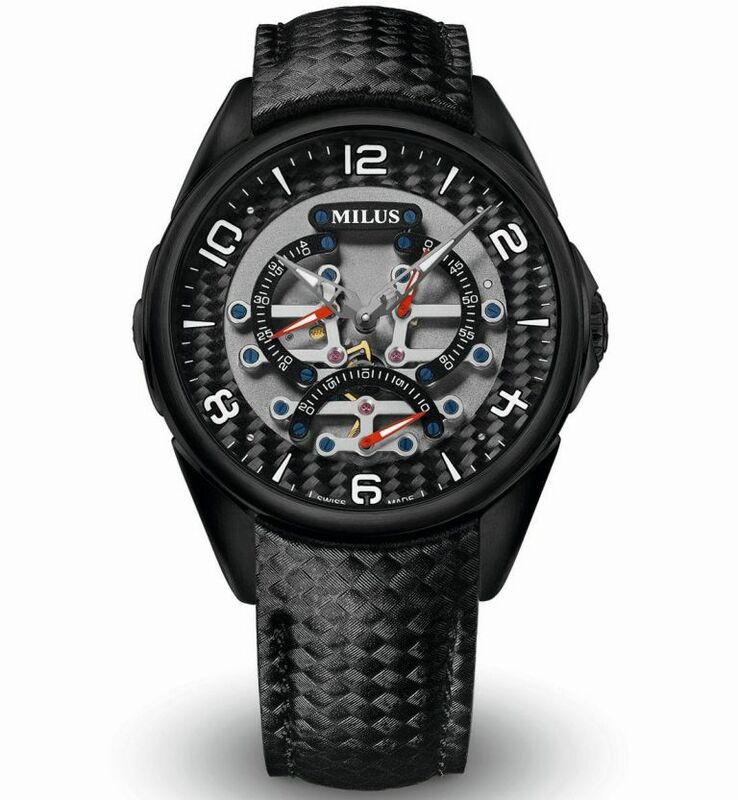 Swiss luxury watch brand MILUS welcomes two new models in its TirionTriRetrograde 42. The new versions will feature a modern and sophisticated white-grey-blue concept, and an ultra-sportive look emphasised by a layer of carbon fibre. It plays with time through its exclusive TriRetrograde mechanism that displays the seconds on three arcs measuring twenty seconds each. And it makes light of time thanks to its original and timeless design that is able to put on a thousand faces and adapt to all tastes. Within a span of five years, the Milus TirionTriRetrograde has made its mark as a classic of watchmaking, combining elegant looks with an exceptional mechanism. It comes in many versions, in various metals, colours and finishes, and in three sizes, for every wrist: 47, 45 and 42 millimetres. Milus has now added a new page to the legend by offering the TirionTriRetrograde 42 in two new variations, each with a clearly fashioned personality. The TIRS010 revisits classicism with a beautiful symphony of colours enhanced by a three-dimensional architecture. The off-white flange contrasts exquisitely with the centre of the dial, which is grey. The Arabic numerals are crisp and dynamic, their blue colour harmonises with the hue of the hands. The triretrograde seconds are displayed on three arcs in a shade of white. Blued screws hold the components onto the skeletonised mechanism and suggest the exclusive decoration of the finest haut-de-gamme movements. The luminescent white coating ensures that time can be optimally read even in darkness. 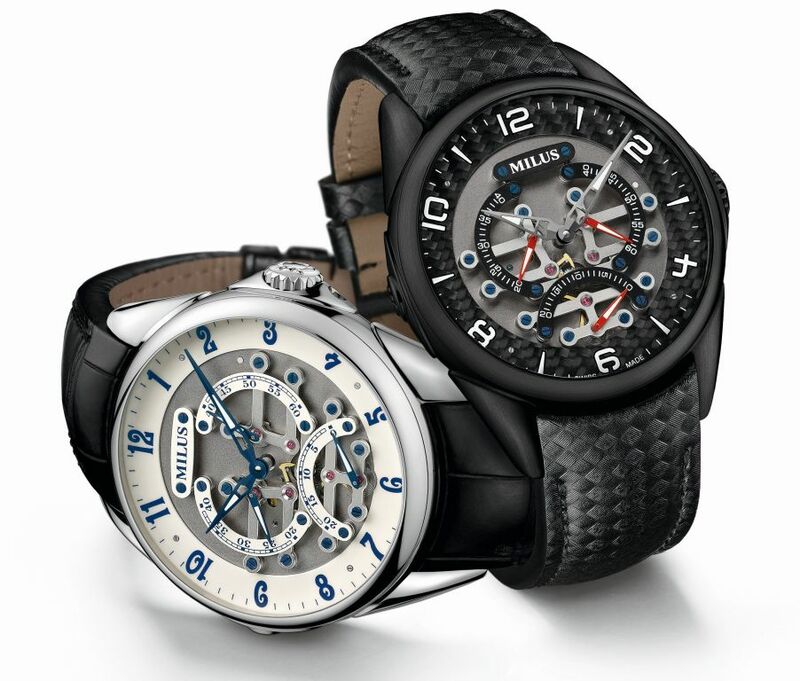 This is a daring and elegant timepiece made for those who appreciate highly personal objects. The backdrop changes for the TIRS016. With its stainless steel case coated in black DLC and its dial ringed in genuine carbon fibre, this timepiece, with a very original look, evokes the atmosphere of the racetrack and the most beautiful race cars. The centre of the watch is contrasting anthracite grey, as are the partially skeletonised hands for the hours and minutes, which are coated in a white, luminescent mass. The reference to a sports car’s dashboard is further underlined by the white Arabic numerals and the three red second hands. The black calf-leather bracelet was given a carbon-like texture, prolonging the look of the dial. This watch has a strong character, for winners and those who love challenging exploits. As with the entire TirionTriRetrograde collection, these two new models are driven by mechanical movements with automatic winding and manufactured with all the benefits of Swiss know-how – and visible through the transparent case back. 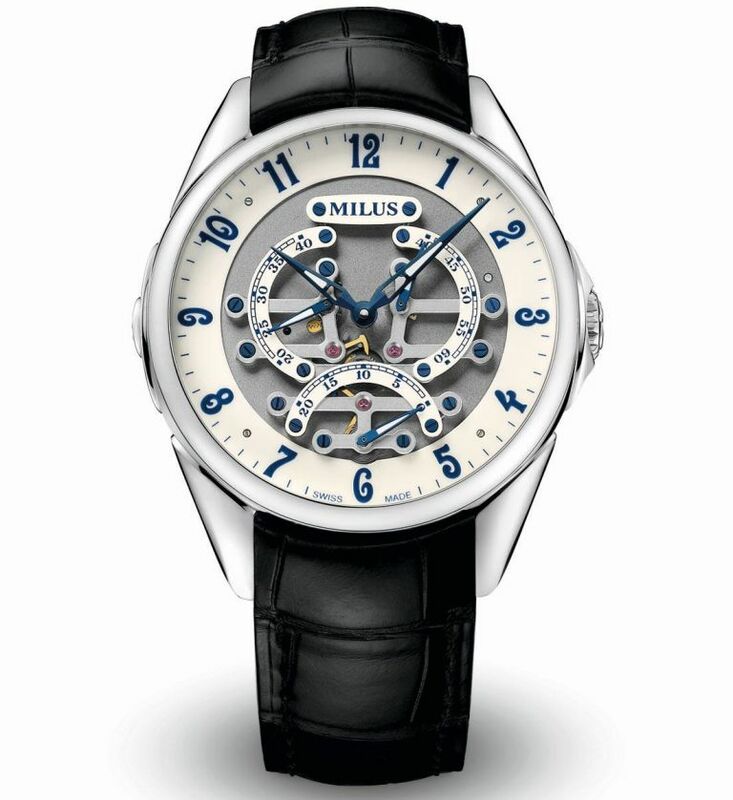 A Milus exclusive, the 3838 TriRetrograde mechanism displays the seconds on three separate arcs at 6, 9 and 3 o’clock. The three hands travel twenty seconds successively, each “passing the torch” to the next one and returning at lightning speed to its point of departure. This great animated ballet, which keeps repeating itself tirelessly, makes the passage of time a playful and fascinating spectacle.